Steffany is the fastest growing network of fashionable beauty salons with a full range of beauty services, such as hairdressing, nail services, make-up, face and body care, and much more. Steffany specialists make top care of beauty and help to choose a fashionable and memorable image that emphasizes the individuality of each client. 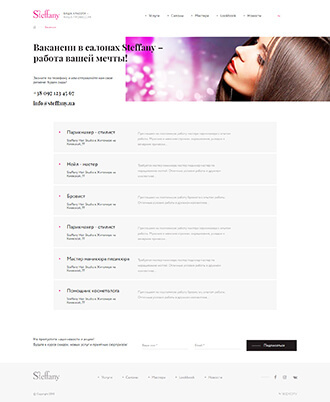 Create a website with visual information about salons, services and prices of the company. Provide convenient display and promotion of the master book, and help customers with a quick search for the nearest salon. 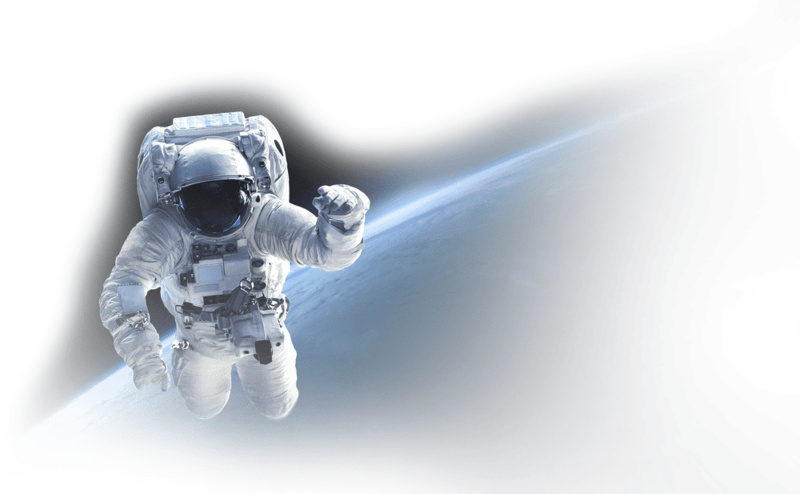 Site design will be implemented in a bright and at the same time concise Fashion style. It is also necessary to develop a visual connection between the information about the service, the salon in which the service is provided and the pecialists who are involved in it. 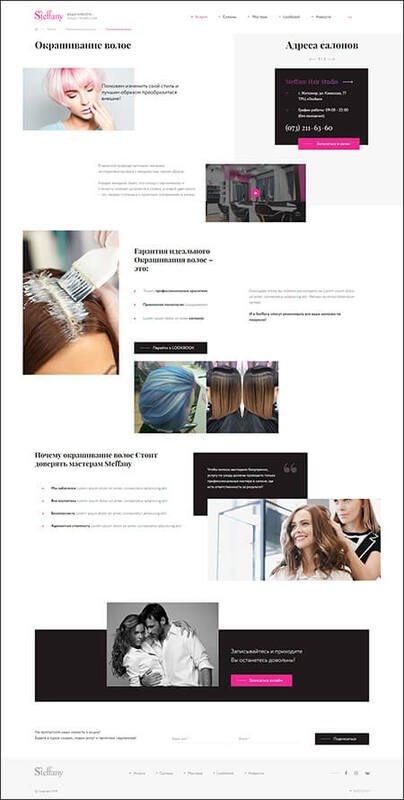 Inheriting the tasks and themes of the project, it was important to display on the website the atmosphere of stylish solutions for female beauty, fashionable entourage and high transparent professionalism of the company. The site meets with a colorful start page with a smooth overflow of background color in soft colors. 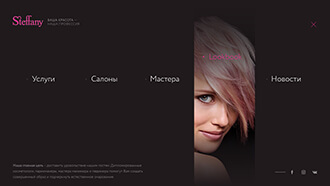 Each of the salons is flipped through in horizontal scrolling and has its own individual thematic set of colors. Everything is done at the same time stylish, gentle, unusual and charming. 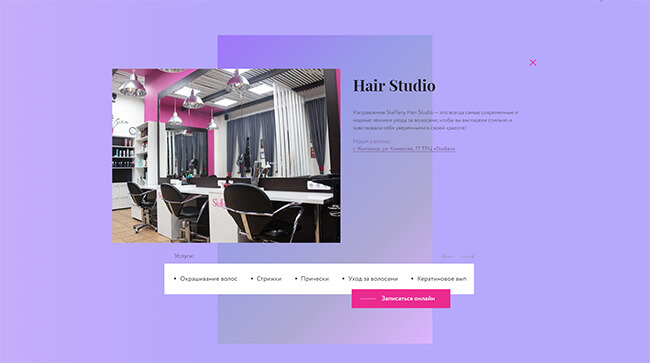 From the bright screensavers of the start page, the path is laid directly to the salons of the company, since they are the main haven of beauty magic. On the salon page you can get acquainted with the peculiarities of the institution, prices of services, technicians and products, as well as pre-select a specialist in skills, photos, and in general, liking. The company's services are represented by a cascade of photos with small notes. The site visitor has no chance to miss an important section or get tired of reading. Overall visibility is complemented by photos of satisfied customers in the process of performing procedures. Professional, experienced and caring master is the most important aspect for creating beautiful images and maximum comfort for customers. Steffany Specialists have what to be proud of and what to say. You can find out more about the working bees of the company at the pages of masters and bright Lookbooks. 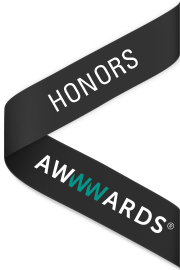 Auxiliary, but no less important, pages include news, promotions, vacancies, pop-up menus, and other visualizations of prospectively useful information for the client.